The Orange County Veterans Memorial at Chapel Hill is now accepting donations. It will take a lot of work to raise funds for this community project. We want to make it a true gift of the people and community of Orange County to our veterans. Want to make a donation on-line? All donations are made through the Orange County Community Giving Fund (a fund of Orange County for Community Purposes. See IRS Publication 526), and are fully tax deductible. The fund will designate your donation to VETERANS MEMORIAL when you select our memorial in the drop-down menu. There is a registration process for on-line donations. This process ensures your information is protected and that you will receive an acknowledgement from the Orange County Community Giving Fund. You can donate on-line by credit card. 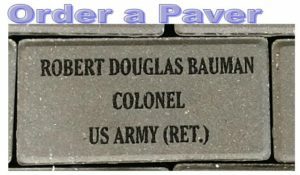 Brick pavers are now available and will be on display around the finished flagpole plaza. A community service organization fundraiser to benefit the proposed memorial. Most efforts by groups and organizations take time to organize and develop. Now is the time to bring the question up at your next meeting. Tax information on donations. The Community Giving Fund is intended to be an encompassing fund for Orange County government, so donations can be given to any department or County-sponsored activity through this fund, which is managed by Orange County and SunTrust Bank. All gifts will be tax deductible and used for the purpose for which they are given and acknowledged as such. Additionally, this fund is a framework for receiving a variety of donations, whether it be cash, stocks, bonds, or real property. Have questions on a process, procedure, or tax deductibility? Contact our Secretary, Lee Heavlin, at donate@orangecountyveteransmemorial.com or call 919-260-6571.